What is the vintage of this Ford F250. I saw it today in the parking lot of the local mall and thought it was a good looking vehicle. 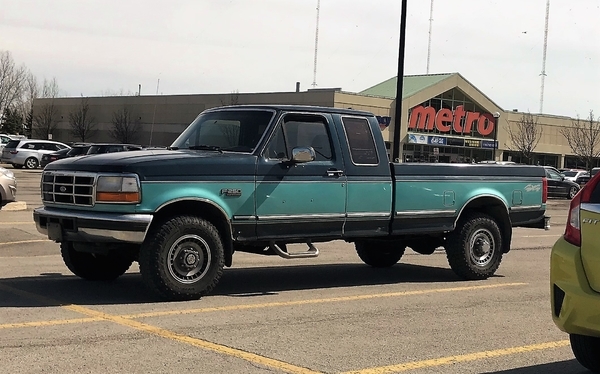 Assuming the truck is stock as seen, that’s a 1994. That bumper became available in 1994 with the power stroke introduction. The bumper became standard on all XLT’s in 1996 even with a gas engine. That color scheme was available 1993 thru 1995 and those hubcaps were standard XLT issue in 1992-1994. The presence of body side moldings behind the rear wheels also makes it 1995 or earlier. Again, I’d say 1994 is shown as stock. Looks like the truck also originally cane with the low mount stainless “west coast” camper towing mirrors. A nice heavy duty pick-um-up.